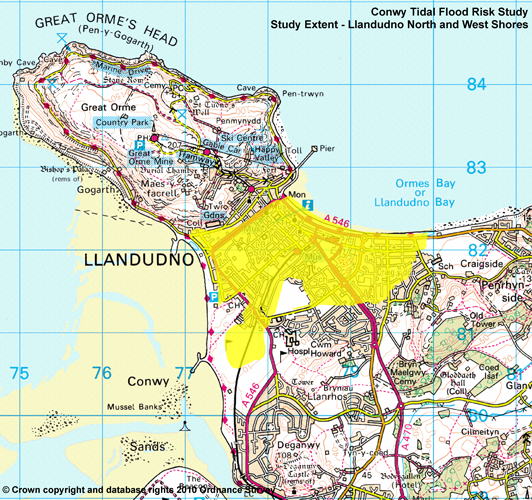 The Conwy Tidal Flood Risk Study details work undertaken by Conwy County Borough Council and HR Wallingford Ltd to examine tidal flood risk in Llandudno (North and West Shores) and in Pensarn to Kinmel Bay. The study was undertaken with the objective of providing a robust scientific appraisal of flooding from tidal inundation. The areas identified for examination within the study are largely, but not entirely, defended by extensive coastal and river defences. It is particularly relevant to note that many of the defence lengths associated with the areas under examination have been reconstructed in the past 20 years, with associated improvements being provided in their Standard of Protection. Use of the Flood Map website is subject to the disclaimer towards the bottom of the Flood Map page. The map itself shows areas with a risk of flooding as blue polygons overlaying the map. These results have been derived using the best information available at the time, however, it is possible that changes to the landscape (such as new flood defences) may occur in the future. Please also note that the study principally covers flooding from the sea, the only fluvial flooding taken into account is that from the River Clwyd. In addition surface water, ground water and sewer flooding have not been specifically covered by the study. In a number of breach locations have been considered in both Llandudno and the Pensarn to Kinmel Bay areas based upon using the best available information at the time, and further details of these breach locations and assumptions can be found under the 'HR Wallingford Reports and Drawings' section of this website. 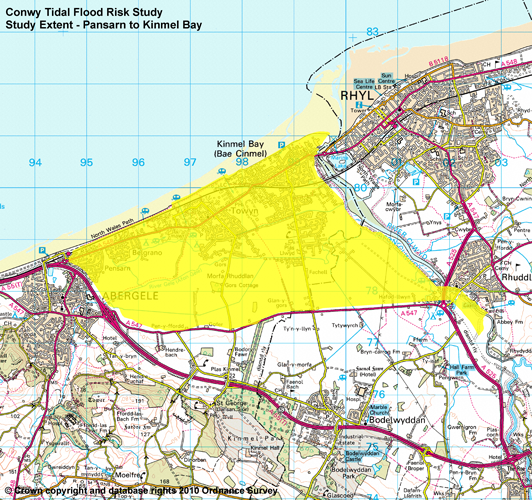 The landward limit of the study areas is described by the Indicative Floodplain Maps as identified by the Environment Agency in 2001.